We are officially at the half way mark for the year! That's kind of insane when you think about how fast this year is flying by, it seems like it was just the beginning of the year yesterday. 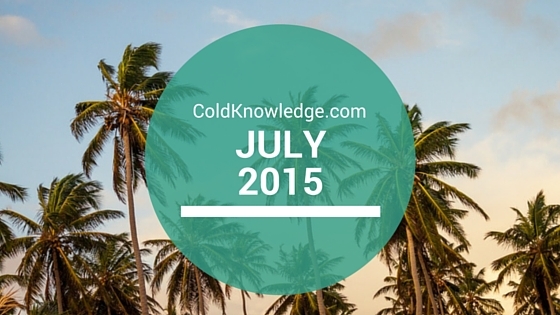 There are a lot of big things that I covered in my previous monthly update for June. so July is going to be pretty much reinforcing what I covered because it was a lot of goals to accomplish and I knew it would take some time to do. It's actually pretty funny because I realized that the things that I wanted to do in regards to making significant changes to my blog at the beginning of next year, I need to start planning for right now. I literally spent all of Sunday just researching and looking up things that I need to prepare myself for, and it was pretty overwhelming, and the biggest thing that I realized is that I'm going to need help accomplishing all of my goals. Luckily for me over the last six months I've been quietly building my blog network up, so I have plenty of fellow bloggers helping me right now, but I know I need to kick it up a notch personally. But as much as it's overwhelming, it's also exciting that I'm even in this position to do something like this, I've worked pretty hard on phase one, so now that I'm beginning to work on phase 2, I'm excited. I didn't realize I watched so many movies this year until I started putting together this list lol. But those are the movies that I like so far for the year, I came to the conclusion that I'm going to re-watch Jurassic World for the simple fact that I'm really bias against that movie because of the first two, (third one doesn't count). So that movie will either move up on the list or down depending at the time, I'll probably give it a watch when it heads to the $1 theater because I'm not really paying for that again. And there you have the updates for July, there's a lot of things going on and I'm still releasing five blogs a day for the rest of the year. That's the number one goal and I have plenty to talk about, So I'm more than confident that the posts will keep on coming for the rest of the year. I have a couple of new series that I'm going to be introducing soon as well, so be on the look out for that and a few popular series coming back as well. There's a lot of things going with the site, so I'm excite and what not. If there's anything that you want to see on here, or you want to participate, shoot me a message through my contact page, or just leave a comment below, I welcome all interaction! Yeap, I'm a big Mission Impossible guy, and I'm ready for that Fantastic 4 to come on out.